All hikes begin at the Daley Ranch entrance on La Honda Drive unless otherwise noted. Hike location directions given below. Bring water, sun hat, sunscreen, and proper hiking boots or treaded footwear. All trails include steep and/or slippery sections. Please do not leave valuables in your car. 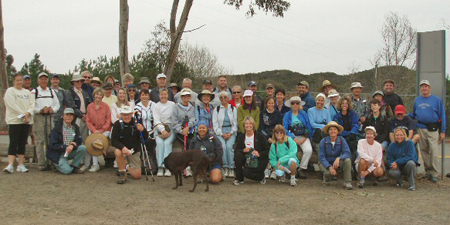 The hike schedule is also available at www.escondido.org and www.visitescondido.com. Steady rain cancels the hike unless otherwise noted. PLEASE NOTE: Drinking water is not available in many areas of Daley Ranch, so be sure to carry a sufficient supply. Meet Naturalist William Sherrard for a slow to moderately paced hike on the trails of Daley Ranch. The planned hike is between five and seven miles in length and will last about 2.5 to 3.0 hours. Bring plenty of water as there isn't any water source on the trails. There are plenty of spots to turn back to the parking lot if you wish to shorten the hike. Allied Climbers of San Diego is hosting a volunteer clean up of the Eagle Peak Area. Sign in at the Trout Cove Parking Area to help us remove graffiti, trash and give some TLC to our climbing area. Please note: pets are not allowed in the Eagle Peak area. Minors with adult guardians are welcome to perform trash abatement. Approximately 1 mile from the La Honda entry is the Historic Daley Ranch House. On the 2nd Sunday of every month from 11:00 a.m. to 2:00 p.m, the Ranch House is open to the public, at which time Ranger Staff and Docents provide information and insights into the history of the ranch. Steady rain cancels. 22nd Annual Hidden Valley Kiwanis Foundation Charity Trout Derby at Dixon Lake! Join Naturalist Sally Sanderson as she leads an easy-paced bird walk of about 3 miles, lasting two to three hours at Lake Wohlford. Participants will follow the southern and eastern shoreline from the parking lot on Oakvale Road. Bald Eagles and Ospreys might be seen among the resident birds and early summer visitors. Bring binoculars, hat, water, and wear layered clothing. Heavy rain cancels. MEET AT THE LAKE WOHLFORD/OAKVALE TRAILHEAD AT 8:30 A.M.
Lake Wohlford Trailhead-From Interstate 15, take the Valley Parkway exit in Escondido and go northeast about 5.5 miles. Turn right on Lake Wohlford Road and go 1.9 miles to Oakvale Road. Turn slightly right onto Oakvale and go about one mile and turn left into the fenced parking lot. La Honda Trailhead-From Interstate 15, take the El Norte Parkway exit in Escondido. Go east four miles to La Honda Drive, turn left, drive one mile to Daley Ranch entrance and park in dirt lot on left. Cougar Pass Trailhead-From Interstate 15, take the El Norte Parkway exit in Escondido east about a half mile to Broadway. Take Broadway north four miles to Cougar Pass (dirt road), turn right, and drive one mile. Park in the asphalt lot on left. Caballo Trailhead-From Interstate 15, take the Valley Parkway exit in Escondido and go northeast about 5 miles. Turn left at Bevin into the Eureka Springs development. Follow the road toward the filtration plant entrance and turn right at the Escondido Humane Society sign (Volunteer Lane). Lake Wohlford Trailhead-From Interstate 15, take the Valley Parkway exit in Escondido and go northeast about 5.5 miles. Turn right on Lake Wohlford Road and go about a mile to Oakvale Road. Turn slightly right onto Oakvale and go about one mile. Turn left into the fenced parking lot.